Many older jointers and less commonly planers used a style of cutterhead now known as "clamshell". A clamshell head has two or more steel or cast iron covers that bolt to the cutterhead to make the head "round". The covers in turn sandwich the knives between the cover and the cutterhead, holding them in place. Ironically, clamshell cutterheads were often referred to as "safety cutterheads" in old literature. 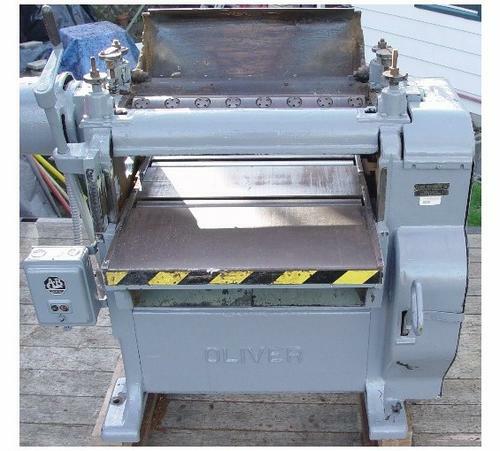 The clamshell cutterhead was in part designed to replace the also dangerous square head which was bad about grabbing items (including arms and hands) and pulling them into the machine. 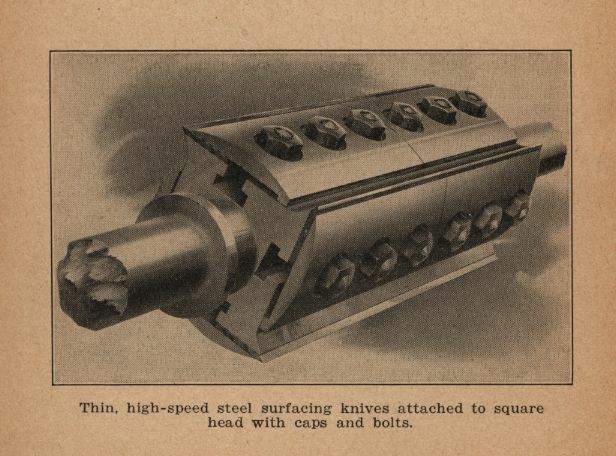 With the theory that a round cutterhead would be less likely to pull a hand into the machine, it was dubbed a "safety head." 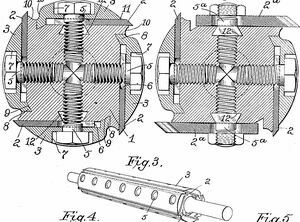 Unfortunately, engineers at the time did not realize that the design was flawed and could lead to disaster when the clamshells failed. Because of safety issues, the clamshell style of cutterhead is no longer used by modern manufacturers. Not only are the knives held in directly by the bolts, but the caps that pinch the knives are also held down by the bolts. The caps are heavy, and under the same forces as the knives. 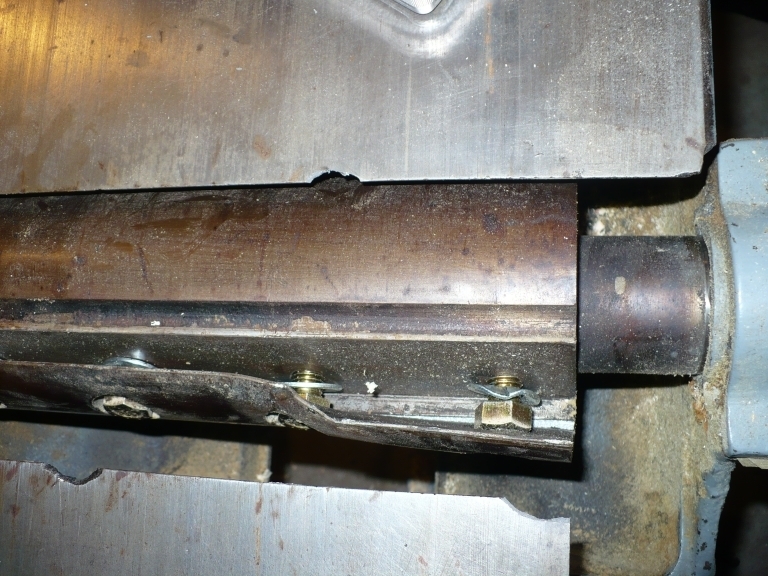 When a bolt fails, usually at one end, the cap bends, hitting the infeed table with considerable force. 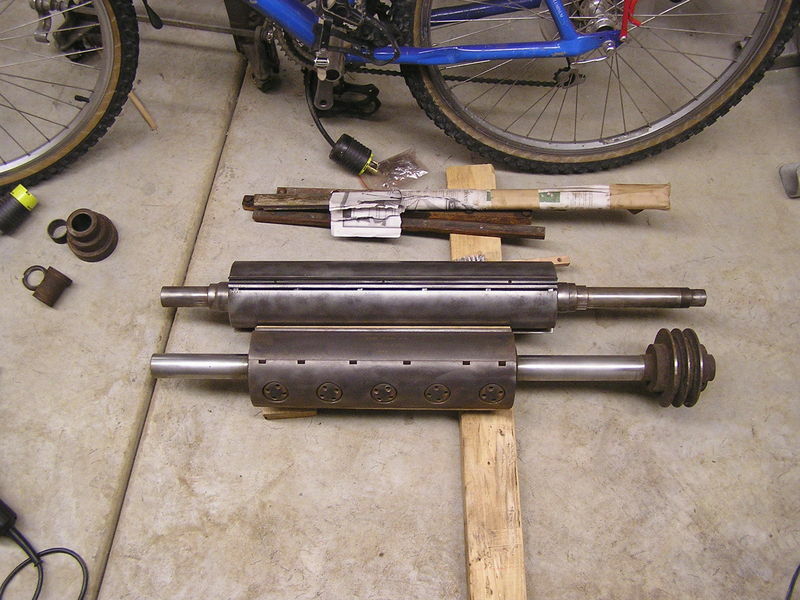 To reinforce the dangers of clamshell heads, there have been at least three accidents mentioned on the OWWM forums in recent years. Do you have the kind of equipment that can evaluate the condition of the bolts? Do you know they have never been over-tightened? Are you sure you have all of them sufficiently tight? Are you sure that the bolts are tightening on the caps and not bottoming out in their holes? Unfortunately, clamshells are accidents waiting to happen. While many people have used them safely for years, statistically speaking, the longer you run one, the more chance there is of that accident happening. The bottom line is that life is too short to take a chance with a clamshell head that can cause serious injury to anybody nearby when it fails. Even if you are lucky enough to escape a failure without injury, your machine will probably not be so lucky. Another wide-ranging discussion of clamshell issues such as bolt head size, torque, use of Loctite, etc. can be read in this forum thread. A square head that is set up to use thin (non slotted knives) with knife caps. The knives are retained by the cap, not the bolts directly. Could be called a "clamshell" I guess. 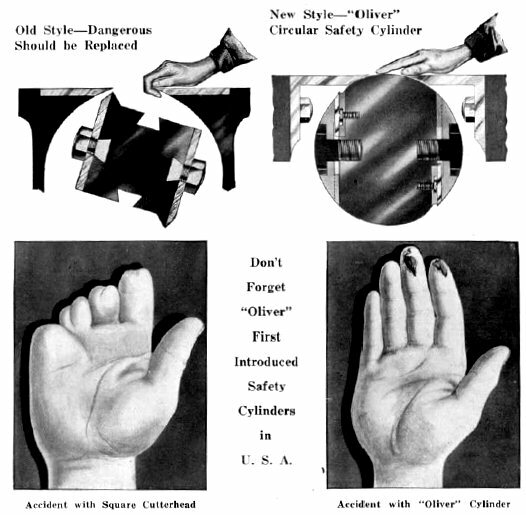 Clamshell illustration from an Oliver Catalog. Although clamshell cutterheads are more often seen on jointers rather than planers, their use in planers is considered slightly less risky. This is not because there is a less likely chance of one letting go, rather that if it does go that the flying debris is more contained inside the planer as opposed to being more open in a jointer. (Jointer cutterhead guards have been reported to have been penetrated by flying debris from disintegrating jointer knives.) However, it should also be noted that great internal damage to the planer is likely, and planer cutterheads are more difficult to remove and replace than jointer cutterheads. An interesting sidebar, square cutterheads are similarly considered less dangerous in planers than jointers, but for a very different reason. 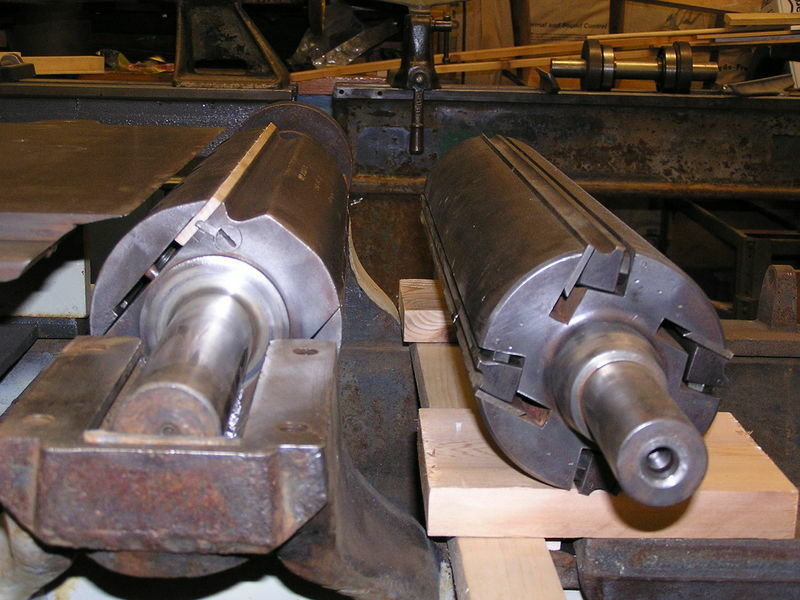 An automatic feeding planer does not require that the operator's hands be proximate to the cutterhead while it is spinning, while a jointer requires the operator to manually feed and thus the operator's hands pass close to the cutterhead. 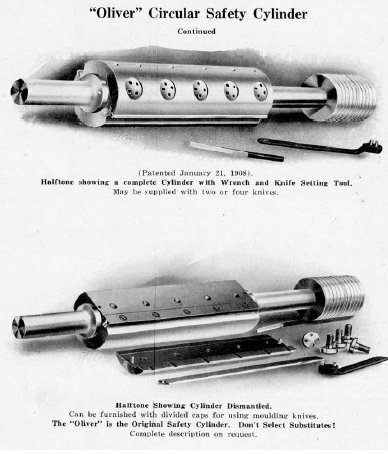 Back in the day, square cutterheads were apparently outlawed in industrial workplaces on manual feeding jointers and planers, but not automatic feeding planers. Here is a "Stutzman" head. It can be used as a square head, with slotted knives, or with caps that clamp the knives. 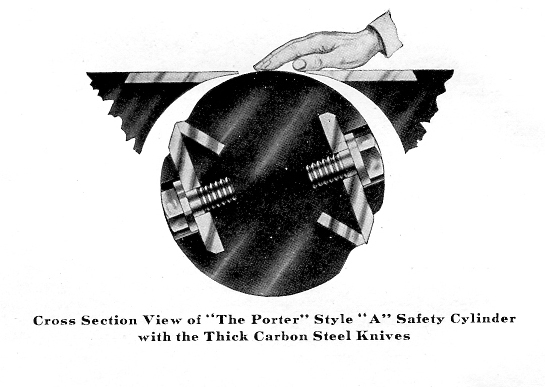 The Porter Style "A" safety cylinder uses a slotted knife and has an unsupported "cap" portion that gives the head a cylindrical profile. The Porter had a replaceable wear strip/chip breaker located at the cutting edge of the knife. The Oliver head incorporated a similar replaceable strip that served as the knife seat and chipbreaker. Cross section diagram of a Hall & Brown clamshell, contrasted with a square head.